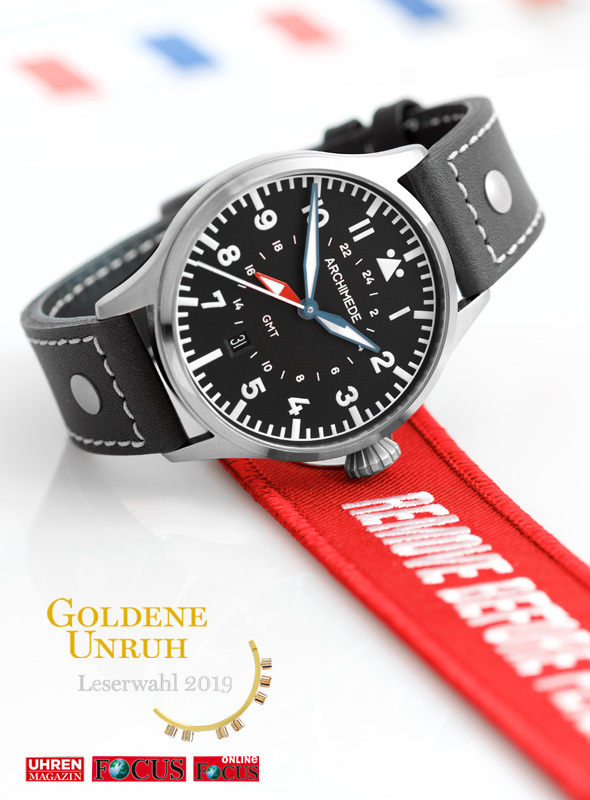 It’s time again – at this year’s election of the best watches ‘Goldene Unruh (Golden Balance) 2019’ we participate with our popular ARCHIMEDE Pilot 42 GMT. We again made it under the Top 10! Until January 11, 2019 (midnight) you can vote for us and take part in our raffle. Good Luck! 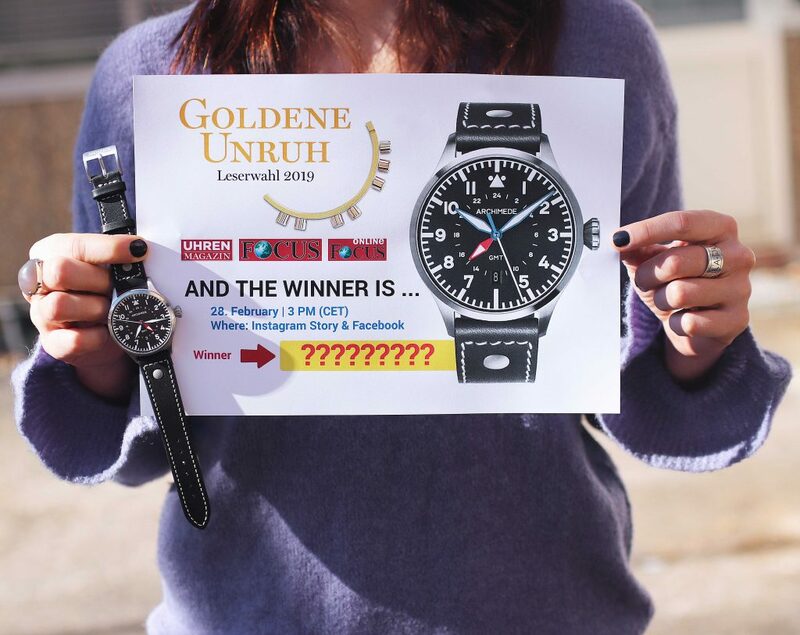 It’s time again – the election of the best watches‘Goldene Unruh (Golden Balance) 2019’ has just started. Last year we made it under the best 10. Of course we would like to repeat that success! 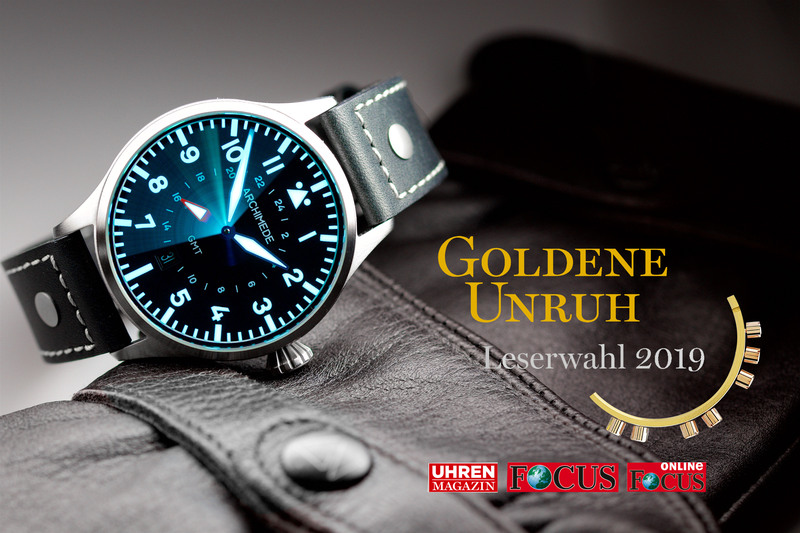 In this year’s ‘Goldene Unruh’ we participate with the Pilot 42 GMT and our in-house made heat blued steel hands. We would be very happy if you give us again your vote! 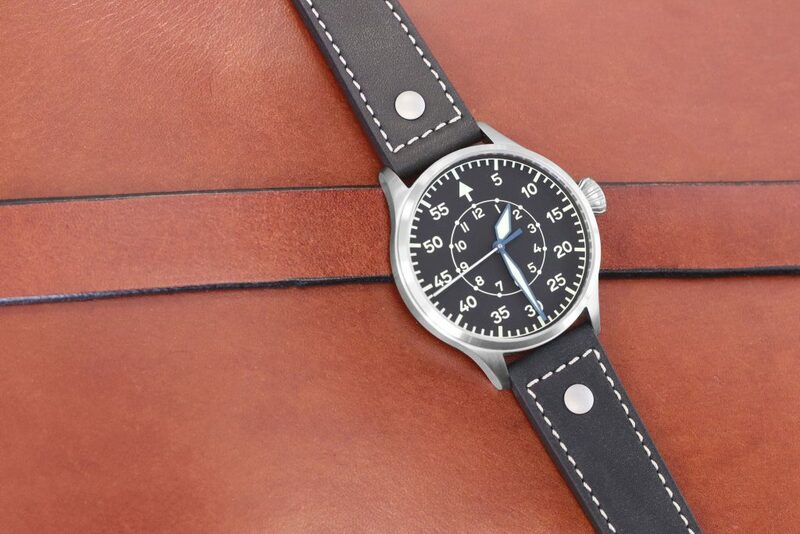 You will find the Pilot 42 GMT in category A (2nd row) (watches up to 2.500.-). The vote will run until December 2, 2018. Please be informed that the election page is only available in German. Thank you very much for your vote! 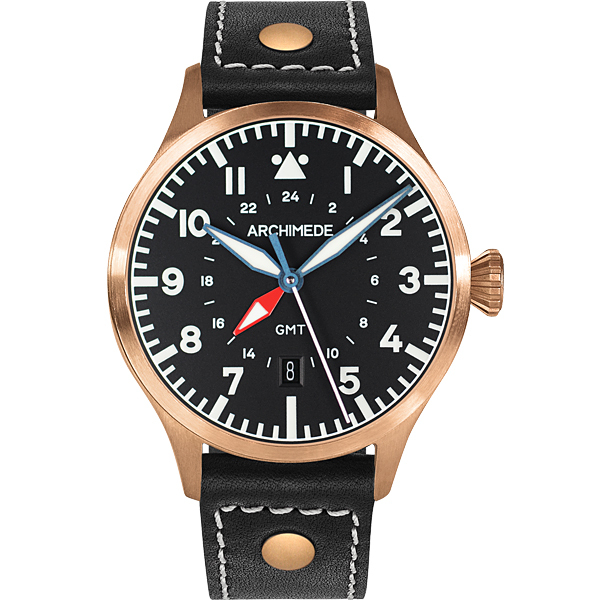 We are very happy to introduce our brandnew ARCHIMEDE Pilot 42 GMT with a stunning bronze case. Enjoy the first pictures of that Beauty! You will find all technical information and pricing in our ARCHIMEDE OnlineShop. 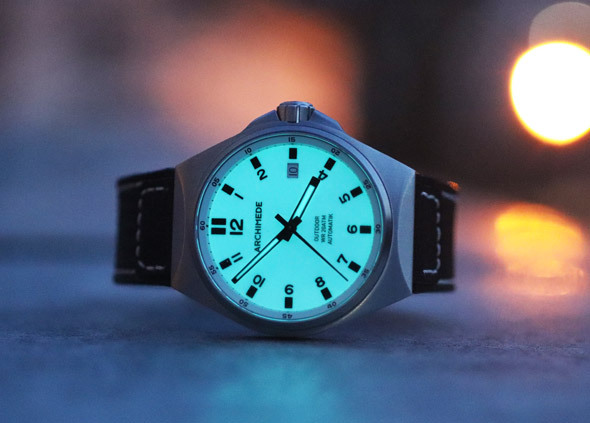 The new OutDoor family member OutDoor 41 AntiMag with antimagnetic, hardened stainless steel case, heat blued steel hand with luminous tip. Luminous minute and hour hand, Swiss automatic movement. The OutDoor 41 AntiMAg costs EUR 980 (incl. VAT) and can be ordered in our OnlineShop. This beautiful B-watch with heat blued steel hands is our shooting star today! 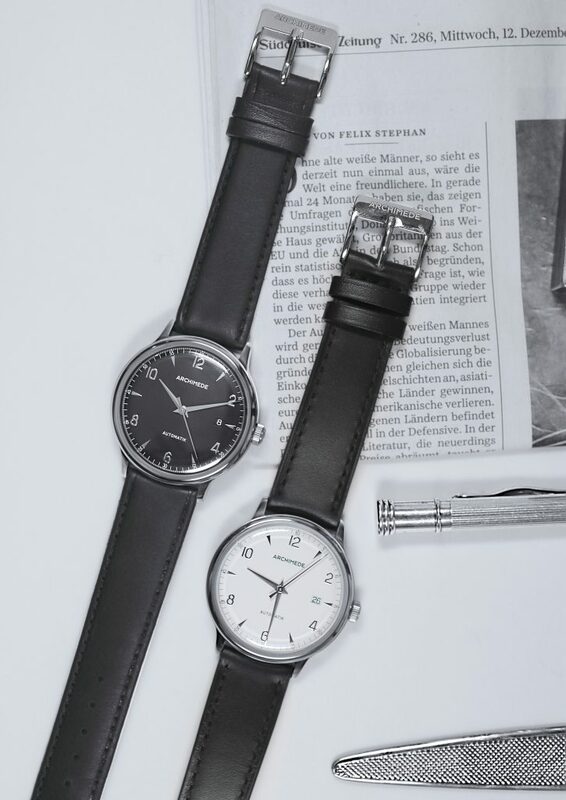 The combination of the soft leather and the stainless steel case is just great! Finally, we can offer again the great OutDoor with full luminous dial and luminous hands. 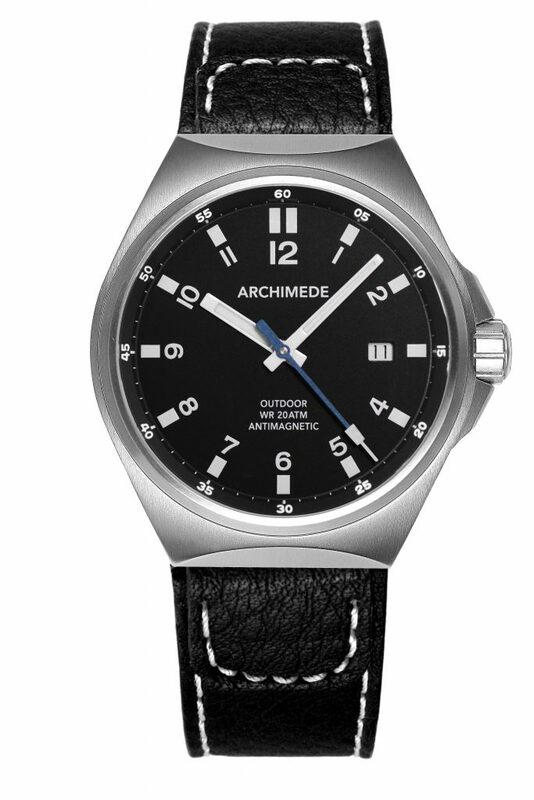 You will find all information on our ARCHIMEDE website. Last summer we introduced the ARCHIMEDE Pilot 42 GMT, the ideal companion for pilots, frequent fliers, businesspeople and world travelers. 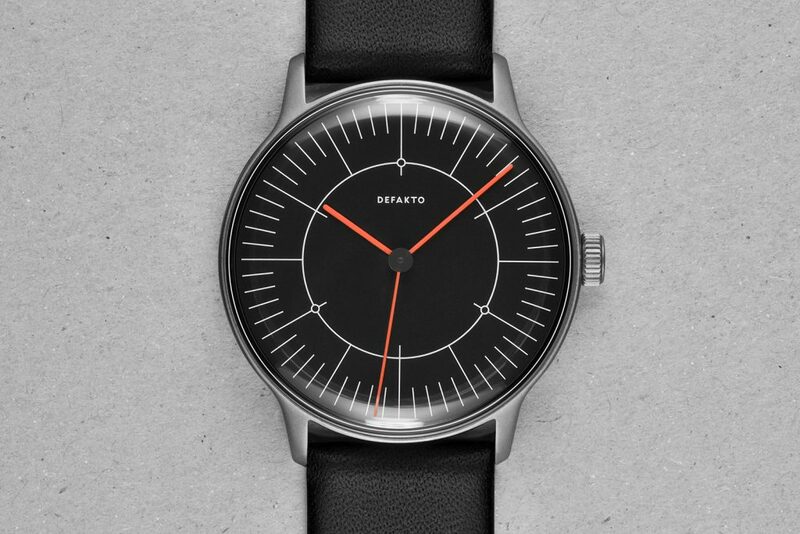 This watch has an extra, red hand that allows wearers to easily tell the time in a second time zone. This function is perfect for keeping an eye on the time in your home time zone, watching foreign financial markets, or even those in long-distance relationships that traverse time zones! Since we began offering the Pilot 42 A and 42 H with thermally-blued steel hands, we have had a host of inquiries about whether we can make similar blued hands for the Pilot GMT. We are now delighted to announce that our popular Pilot GMT watch is now available with our in-house fabricated, thermally-blued steel hands. 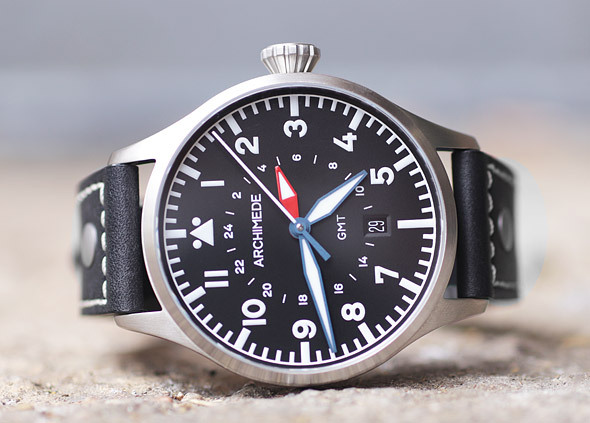 The Pilot GMT with blued-steel watch hands is available in the ARCHIMEDE Online Shop starting from 1,160.00 EUR (974.79 EUR excluding VAT).